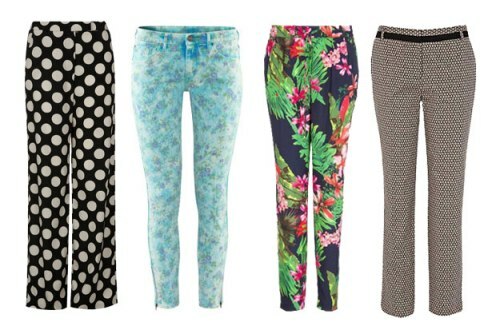 The printed pants do not understand discretion and this spring hoard much prominence as part of the hit of the season. Attentive to your user’s manual. Sure you could not resist trying on printed pants. 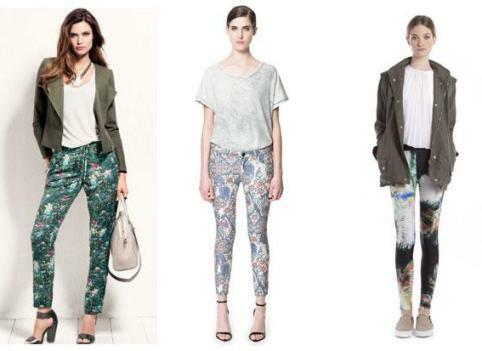 This spring flowers, animal print, camouflage … become protagonists and are stamped on the pants with greater or lesser impact. The pants of the season comes off from the body to the palazzo style, fits like a glove in key skinny or capri version leaving bare ankles or baggy pant version adopted for a more casual look. 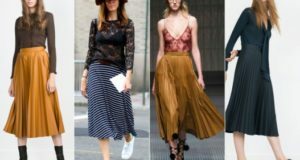 Now, though spring encourages us to incorporate color to our wardrobe, it is true that the printed pants has its own complications to the level of use, especially when our goal is to disguise our thighs or neutralize the width of our hips; would like to say that we can not take them? No. 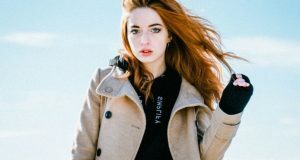 It is necessary to know what are the characteristics that define our silhouette, to have clear objectives and our ally to garments that we feel better. When choosing the color and prints note that bright colors provide volume as well as the color contrast. If the objective is widening your thighs, perfect. To hide them, opt for a model of dark trousers with print whose design is small and range. The more discreet is the best pattern. Not only has an impact on the outcome of the print, also the style of pants. The model is very comfortable baggy pant but adds bulk in the hips and thighs so the right option if you are looking for styling your legs. However, the palazzo model is is ideal to lengthen the visual effect of the silhouette. If you combine it with heels, grow as if by magic. On the contrary, legging or skinny model best printed book if you have the legs very narrow and want to increase visually the thighs. Finally, capri pants or straight Chinese style is an ideal choice to wear this model without visually shorten the silhouette. Finally tissue type will also affect the result. The weights have you contribute certain linearity that helps stylize your silhouette. Body tissue plays an important role since it will help you structure your curves. Finally, the thickness of the tissue will affect the volume that contributes to your legs. Previous: Hydrated skin: Tips to have a glowing complexion!